Glam Polish has been on my radar for a long time. Every collection that has been released looks like a stunner, but they knock out so many collections so often it's just hard to keep up. I'm very all or nothing. If I can't have them all, I don't want any. It's just too hard to make decisions. I decided to force myself to make some decisions recently and pick up a few colors. I wanted everything in stock of course, but I could only have a few. I started out with the Under the Sea collection that was released in August to pick out my first few Glam Polishes, this is one of that lot. 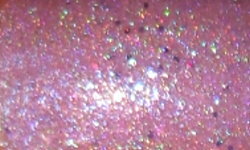 Sealiest Thing I've Ever Heard is a baby pink holo with purple glitters. Color: I took a gamble on this color. These pale pinks and purples can either be a hit or a miss on my skin tone. This one didn't clash too much though and I like it! I like the soft subtle color and the contrasting darker glitter. I have to be honest though, I am a bit let down. I feel like many of the photos I saw of this collection looked way more sparkly than the real life result. This is still an absolutely beautiful and top notch polish, but I was expecting it to knock my socks off. It's lovely, but it did not blow me away. Formula: The formula on this was good and easy to use. I used 2 coats. Price: This is $11.00 on the Glam Polish site. Overall: I really do like the Sealiest Thing I've Ever Heard. I don't want my words to get misconstrued because this is definitely a gorgeous polish. I've just been oogling over this brand for so long and have been mesmerized by the beautiful swatches. I just think the sparkle factor in this is a little more subdued in real life than I expected. I would still recommend this brand, but definitely look at a handful of swatches before making your decision!